While we’d been incredibly fortunate with our Monday night Horsetail Fall shoot, we didn’t get the molten glow everyone covets (though I’d argue, and several agreed, we got something better). Nevertheless, based on the relatively clear skies, I decided to take everyone back for one more try on Tuesday. On Monday we’d been able to photograph in relative peace from my favorite spot on Southside Drive, but given that the weekend storm had left us in its rearview mirror, and that word had no doubt gotten out that Horsetail Fall was once again flowing, I guessed that the Horsetail day-trippers (Bay Area, Los Angeles, Central Valley photographers who cherry-pick there Yosemite trips based on conditions) would begin crowding into Yosemite Valley. To be safe, I got my group out there a little after 4:00 (sunset was 5:35). Despite being earlier, both parking turnouts were already teeming cars (if everyone squeezes, there might be room for fourteen legally parked cars)—just a few minutes later and we’d not have found room for our three vehicles (all the late arriving cars that had attempted creative, shoulder parking solutions returned to find parking tickets decorating their windshields). With so many more cars, I wasn’t surprised to find my preferred spot down by the river was already starting to fill—but we spread out a bit and everyone managed to squeeze in. Unlike Monday evening, the Tuesday sky started mostly clear, with only an occasional wisp of cloud floating by. While the scene lacked the drama of Monday, the clear skies boded well for the fiery show we were all there for. We watched the crisp, vertical line separating light and shadow advance unimpeded across El Capitan. The mood was optimistic—borderline festive. Then, a little after five, with no warning the light faded and El Capitan was instantly reduced to a homogeneous, dull gray. 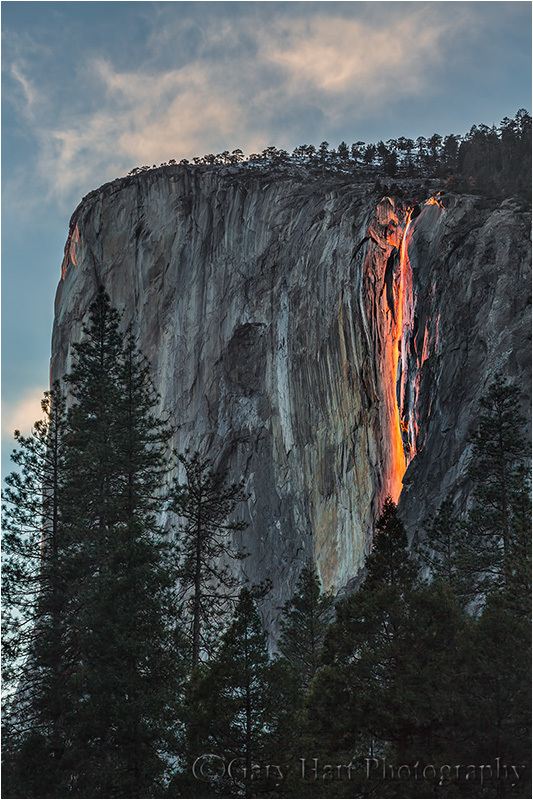 Many people reacted as if their team had fumbled on the two yard-line, but those of us who know Horsetail Fall’s fickle disposition just smiled. In all the years I’ve been photographing Horsetail Fall, I’ve come to recognize how much it likes to tease—while this is more of a gut feeling, it has always seemed to me that the evenings when the shadow marches without pause toward sunset, the light is much more likely to extinguish right before the prime moment. On the other hand, my best success seems to come on the evenings when the light comes and goes, teasing viewers right up until it suddenly reappears in all its crimson glory just before sunset. So, until the light disappeared I was a little concerned that things were going too well. But when the light faded I was able to guide them away from the ledge and reassure them that there’s no reason to panic just yet. And sure enough, about ten minutes later the sunlight came flooding back and everyone exhaled. As shadow advances from the west, the remaining light warms—by 5:25 it had reached a rich amber. Once it reaches that stage my advice to everyone was that, since the show will either get better (more red) or worse (the light snuffed), and there’s no way of telling which it will be, they should just keep shooting until the light’s gone. And that’s what we did. At first there were no clouds and my composition was fairly tight to eliminate the boring sky. Then, just a few minutes before the “official” 5:35 sunset (I should add that “sunset” when you see it published refers to the time the sun sets below a flat horizon—it set far earlier for those of us on the valley floor, and it wouldn’t set on elevated Horsetail Fall until nearly 5:45), a nice cloud wafted up from behind El Capitan and I quickly went wider to include it. On the way to dinner with the group I breathed a sigh of relief knowing that my life had just become much easier. For many in the group, what we’d just photographed was their primary workshop objective—for some Horsetail Fall is a bucket-list item. But the nights Horsetail Fall doesn’t light up are far more frequent than the nights it does, and in fact I’ve seen Februarys when it’s only lit up like that once or twice (and I’m sure there have been years when it doesn’t happen at all). While I knew nobody would hold me accountable if Horsetail didn’t put on a show for us, the fact that it did (not to mention the fabulous Horsetail shoot of our first night), meant that I was free to focus the group’s final two sunsets two very special moonrises. )! I love how that big tall spruce (or maybe Ponderosa) tree and it’s left-side branches serve to obscure some of the highlight in the sky with that little pink cloud above. The waterfall, itself, truly IS like molten lava..what magnificent array of color that just blends so wonderfully. Oh, to have been there! And, to me, the finishing prize of this are those two little columns of granite out there on the outer face (upper left in the cliff) that are catching the pink glow as well. Like little lights on the corner telling people when to walk and when not to. I choose to not walk and just look…Completely magnificent, Gary – Thank you SO much for this! You were right, this is definitely for the ages…Sorry to take up so much floor time here but I really love this, and, oh, ‘scuse me, what’s that, Van?…oh, Van says to say he loves it too :-)! Very nice, Gary! Probably one of the greatest Horsetail images I have seen. More water flowing and beautiful color and nice foreground. Gary, the shot is beautiful! Love the composition and the wisp of color just below the left shoulder of El Cap. Nice! Outstanding photo. We went up on president’s day weekend in hopes to capture this image. I guess I’m a day late and a dollar short. I take it you guessed-a-mated when this would take place. I see your day see for next year. Is this just a hunch? I plan to really look at your event and go. Again….my hats off to you…..great picture. Thanks. There are several factors that need to fall into place for Horsetail Fall. First, is the angle of the sunlight at sunset, which happens in a window starting in the second week of February through the end of the month. The absolute best time is the third week of February, but the second and fourth weeks are nearly as good (in my opinion). Second, there needs to be direct sunlight on El Capitan right at sunset—this is something that can’t be predicted, sometimes right up until the instant it happens. And third, there needs to be water in the fall. Again, there’s no telling this far in advance when, or even if, it will happen in 2015. My group was lucky this year because my workshop started the day after a long weekend of drenching rain—by the following weekend the flow was down to a trickle. In a typical year, the snowmelt is starting to kick in by February, but this year has been so dry that the snowmelt is virtually non-existent. Of the three factors, I only have control of the timing—I choose to go on the early side of the Horsetail Fall window because fewer people trumps a marginally better sunlight angle. But there are others who feel differently. This year it worked out for me because we got good water and sunset light, but there’s no telling what next year will be like—I just try to maximize my chances. Wow!!! Such and incredible photo. The photo gods smiled upon you and blessed you with beautiful light.